Landal Travemünde in Travemünde - the best offers! This price applies to Baby Special, with the arrival as 17 June 2019, 2 Nights. 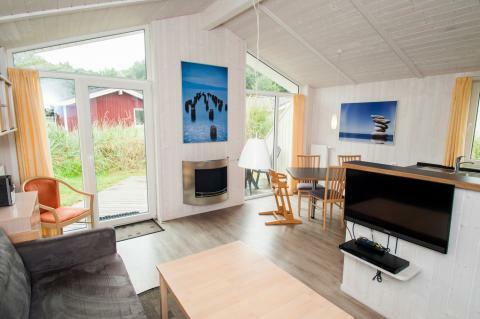 This price applies to 4-person cottage 4B, with the arrival as 17 June 2019, 2 Nights. 30% of the total booking amount is due on or before 14 days after booking. Landal Travemünde is located directly on the German Baltic coast on the Priwall Peninsula. Explore the area by bike or segway or go and try out the various water sports activities. Take a walk along the beach, enjoy the view of the lighthouse, or relax in the wellness centre. If you fancy a day trip, Hamburg is less than an hour’s drive away. Landal Travemünde is located directly on the beach, right in front of the Baltic Sea. The accommodations are modern and have a partially covered terrace. You can drive over or rent a car, because there's free parking at the holiday park. A stay at Landal Travemünde is very suitable for families. Children between 8 and 16 years old can learn to sail under professional guidance along the Baltic coast. Besides sailing, there are many more activities for children in the area. For example, there is an amusement park approximately 11 miles away. Landal Travemünde does not have a restaurant, but there are more than enough in the area. Travemünde is a lively resort with a variety of restaurants and a casino. There are also regular events such as the Christmas market and the Museum Night. Landal Travemünde is surrounded by the waves of the Baltic Sea and the rich green of the Priwall Peninsula. Along the Baltic Coast is a wide sandy beach where you can enjoy the fresh air. There are also water sports activities, such as water skiing and wakeboarding. Rent a bike in front of the resort and explore the area. Bike to Travemünde lighthouse and enjoy a beautiful view of the harbour. You can also cycle to the nearby nature park, where endangered species can be seen. If you’d rather not get on your bike, then join in on a Segway tour of the island!